Well this past month or so has been a whirlwind of chaos in the best (or maybe worst?) kind of way, so I’m resorting to a list form to give the bare basics update of what we’ve been up to. 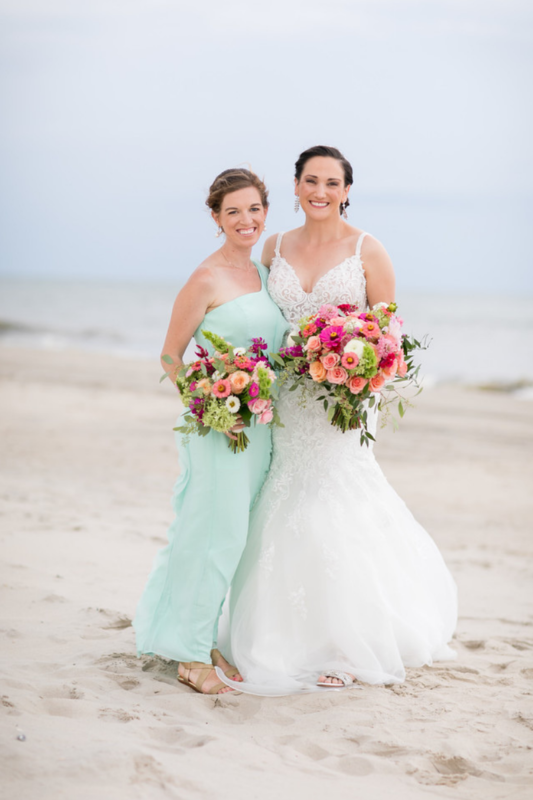 + We went to the Outer Banks of North Carolina for one of my best friend’s weddings! It was a blast but a looooong freakin’ way away from Seattle. This one deserves a whole blog post, so I shall write one. Probably. Eventually. Basically, if you’re on the east coast, I strongly suggest you make a drive to see the Outer Banks! And the wild horses on the beach! And to have the adventure of driving on sand! We had a great time and the girls are still talking nonstop about how much fun they had as flower girls. + We came back from North Carolina and moved a few days later – to the first house we own together! If you’re considering moving with two toddlers – don’t do it. Save yourselves. The move itself wasn’t too bad because we hired packers and movers (always the best decision for our marriage), but I may be unpacking boxes for the rest of my days. Plus, our house renovation is not done so we’re living in a house without most of the furniture we’ll need, without outlet covers, without closet doors, without a master bathroom vanity or shower door… it is not ideal. But we’re in! So that’s a win. + (Pre)school started last week! Not to be confused with the week of Labor Day. We may or may not have brought Clara to school a week early, only to realize that there was no school for another few days. Whoops. Nothing like starting the year with a giant parent fail. It can only get better from here, right?! + Also starting a new year is our Seattle MOPS group! I’m so excited to get the ball rolling with another great group of table leaders and participants! We had our table leader training a week ago and it went super well. It should be a fun year and it’s taken a lot of work to get this far, and there’s a lot of work still left to do before we kick off the year ‘officially’ with our first meetings in October. If you’re a mother of a preschooler and haven’t joined a MOPS group, you should see if there’s one that meets in your area! + We went to Las Vegas last week for a few days while Tim was at a work conference. Luckily, one of my college roommate lives there, so we were able to stay with her and her family (including her sweet and squishy newborn baby!). We had such a fun time in the sunshine and heat and it definitely prolonged our summer for just a bit! + Audrey launched another Fall Outfit Challenge and of course I’m participating! Not having to figure out what I’m going to wear for a few months is a huge win in my book, and I always look forward to the release of her outfit challenges / fashion guides. … And that about sums it up for the last month or so! Now that we’re more settled in to our new place, I hope to have more time to write… but I feel like that’s my intention every time and then life happens! I hope you’re having a wonderful start to the fall season! This entry was posted in currently, week recap, weekend fun and tagged month recap. Bookmark the permalink. Whew- good thing you got out of OBX before the hurricane! Sounds like a super busy summer!! Vegas sounds fun! I’ve never been. Your girls look so much alike that I’m not sure which one is which anymore! 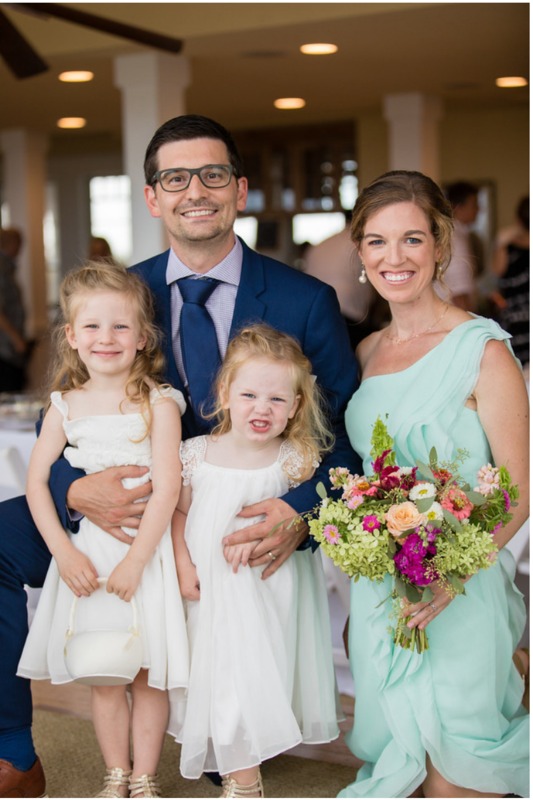 Your family picture from the wedding is too cute – what an expression!